The new Blogger User Interface really gives bloggers a feel of the web 2.0 and i mostly use the New Interface, i rarely face any problem with the New UI but there are people having difficulties running the New Blogger UI. This is a known issue in Blogger but it's annoying that when you want to create a blog post you are welcomed with a blank page. But even today many months after the release of new Blogger UI the problem is yet the same, probably the reason of this problem could be a slow internet connection or because the new Blogger UI is server from the new blogger server. But if you are sure about your connection speed and even the problem is still persisting then there's an way you can get rid of it. Learn how. There's no single way to fix it, the fix depends on why you are facing this error. The most common reasons is some half dead browser like Internet Explorer. Does that mean using firefox or Chrome will fix it ? Not always, you know the new Blogger UI is rich in terms of latest designing techniques. Make sure you have updated version of your browser and also update your computer system drivers regularly, that keeps you up to date with the internet and it's newest technologies. Upgrade Browser : First thing you must do is upgrade your browser to Google Chrome, it's best for the Blogger interface, renders everything quickly. Clear your Caches : If you have up-to-date browser but yet you are facing this problem than try clearing your browser caches and then try reloading the post editor by hitting CTRL+F5, this will load every files freshly. The last option : If none of the above method works then there's only one way to solve this problem or an alternative. Revert back to the old interface, old but gold, for most of the old users like me the old interface is easy to use but new users will find it difficult, check Blogger Support guide to learn about each features of it. 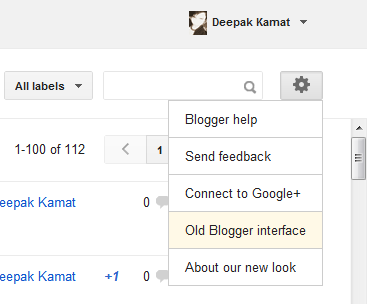 To get back to the old interface go to your Blogger Dashboard -> click on the Gear icon on top right corner and select Old Interface from the menu list.